Last week The Aspen Institute hosted a round table discussion on “Playing Safely: The Future of Youth Football” to address growing concern about the epidemic of concussions on our youth. It should be noted that professional athletes are both more mature (in size and brain development) and are adults who can make informed consent decisions. The issue this panel discussed was for the youth football. At the Aspen Ideas Festival in June, a panel featuring concussion experts and former NFL players considered the health safety risks of playing football. Since then, concerns have sharpened, with many parents of young boys saying that tackle football should not start before age 14. At the same time, football also plays a role in addressing the epidemic of physical inactivity. Our roundtable dives deep into the state of football at the youth/community level with a discussion on reforms — and implications on the game up to the professional level. As the blog began in 2010 there were many things I hoped to accomplish by doing this project; I never dreamed this place would help springboard a family to recovery after the most horrible day of their lives. However, looking back I am glad the blog was here for them and will remain here, for them and anyone else who need answers. It was Sunday, September 26, 2010. Michelle Trenum woke up around 8 am. Gil was out of town, returning that afternoon from a weekend drill with his Navy Reserve unit in New Jersey. Walker, ten, their youngest, was on the living-room couch, hiding under a blanket. He jumped up when Michelle walked in. Boo! That’s odd, Michelle thought. Austin never got up early on Sundays. Not voluntarily. The research is starting to come in; the problem is that results and conclusions bring more questions that should be answered. Naturally some will look at early evidence and make a 180 degree change on their attitudes about certain things. We are talking about concussions and the research associated with it. Unfortunately there is plenty of anecdotal and observational cases that sear into our memory, this perhaps shape our thought process. Along with that there is gathering evidence that supports some sort of process change in how we handle this particular injury. The need to make change is upon us, that cannot be debated; what can be debated is how or what the changes should be. I recently read an article where Micky Collins of UPMC said something to the effect of current concussion concern is like a pendulum that has swung all the way to the other side. Although the changes in sports and activities has certainly not taken that full swing the other way, the pendulum is on the way. His feelings, like mine is that there is no evidence to suggest that a full swing to the other side is warranted, rather there needs to be competent and complete understanding of what we are facing. Rather than making full sweeping changes that would be akin to digging up your backyard to rid your self of a mole; when placing traps and poisons and maybe only having to dig up a small section would fix the problem. There are definitely things we can do as parents, players, coaches, researchers, doctors and concerned people in general to make a dent in the issue. If we find that the changes are not working then taking another aggressive step may be necessary. I guess the reason for the above rant is to reinforce the need for changes, but the right changes. (As I wrote the last sentence I realized how do we know if the changes are the “right” ones; I guess we don’t but certainly what is happening now needs attention). Last year we were privileged to share with you a mothers note about her son and her great loss. Austin Trenum never returned to the family on that fateful Sunday in November and Michelle, his mother, reached out to The Concussion Blog to share her thoughts. After a very long road of recovery that included a new concussion policy for the Prince William County school district, authored by Gil Trenum, and a tough decision to donate his brain to Boston University the wait is over for answers. This post was written on Saturday 7/16/11 in reflection of meeting the Trenum’s. Well I arrived to the Hotel and Conference Center around 2pm EST today the first thing on my list to do was to text Michelle Trenum to arrange a meeting if possible. As if it were fate, the Trenum Family was on their way to vacation in Maine and made arrangements to go out of their way to meet up. The Trenum’s are from Prince William County, Virgina and if you have followed this blog you will know their story and how we have helped here at The Concussion Blog. Ever since I received the email from Michelle I have had Austin on my mind with just about everything I do in regards to concussions. I must say there are even times I look at my own children and can only imagine the pain this family has endured. I really think what you are doing is so important…I only wish more people knew the information before they needed it instead of reading about it afterwards. After working with the Trenum’s since late last year I have taken a special interest in how Michelle and Gil have been doing. Although they will never be the same, what they have been doing in their area has been nothing short of remarkable. It feels good to me that parents like the Trenum’s have taken the initiative to help out, and are doing it in a manner that is professional and proactive. After we ran that story Michelle got back with me with some thoughts and more specific information/wording in the school districts policy. Thank you so much for all your help on this. You really helped give Gil the information he needed to get the policy through. The administration will now be working on the regulations and details. Gil will stay on top of them to make sure all aspects are covered. It was interesting in all the information the board received, the athletic trainers were credited the most as being the go to on this subject. They were given ultimate authority over return to play which is good. Although none of what passed would have made a difference in Austin’s case, once the final medical pathology study is released, we feel that it will keep the momentum on this issue to make changes. Gil and Michelle Trenum of Prince William County, Virginia have taken what was the most horrible day in their life and are doing something about it. After Michelle so genuinely shared her story about her son, Austin — here exclusively with The Concussion Blog — her and her husband refused to believe something could not be done about it. The Trenum’s have put forth a tremendous effort in connecting with some very “stout” individuals in the concussion research and management area. It was not to find out why this happened so much, as it has been an effort to not let this happen again, to any parent or any kid. “A lot of people are asking ‘Why now? What’s so special about these times?’” said Gioia, who was invited by Brentsville District School BoardrepresentativeGil Trenum. “We have a perfect storm coming together in the sense that we better understand the brain, we have the resources at our disposal now that we can be informed about this injury, concussions, which are really a type of mild traumatic brain injury. “There aren’t more concussions than years ago, but we have more knowledge about them and their symptoms,” Gioia said. I saw your blog posting on Brad Evans. 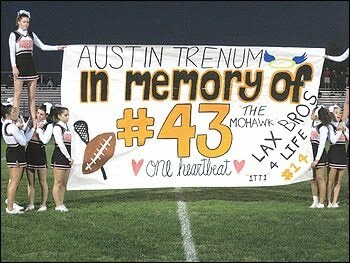 Our son, Austin Trenum, received a “mild to moderate” concussion on September 24, 2010 at his football game. Less than 48 hours later, our beautiful, smart, funny, happy, athletic, talented son took his life suddenly and spontaneously. There was no warning, no depression, no mental health issues, no drugs or alcohol issues, no divorce or financial issues, no trouble with friends, no trouble with school, no fights or breakups with girlfriend, etc. We found out about Brad Evans the day after it happened when the press contacted us noting the similarities of the two boys. We were not up to speaking to the press but a friend who represents the family did call down there. The reporter down in Fayetteville who’d personally interviewed Brad’s family and friends and they all said that everyone said the same thing about Brad: that there was no reason and that he was excited about his future. That sounded so familiar to us.